Take vacation Bible school on the road with 5-Day Club! High quality teaching materials, action packed fun and loads of relationship building make 5-Day Club one of the most fruitful ministry events of the year. Take your ministry to the kids; don’t wait for them to come to church. Think of the places where kids spend their time during the summer; community centers, daycares, parks and summer school. These are the places your church will want to minister through the 5-Day Club. The 5-Day Club meets once a day for five days. 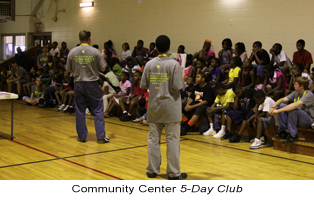 Churches have had great success with choosing three locations in nearby neighborhoods to have a week of 5-Day Club. On the last day of the week they have a rally or special event at their church. The relationship building that has taken place all week long helps bring the children and their families to the church. Evangelistic Bible lessons, high-energy games, meaningful songs are all part of what makes a 5-Day Club a memorable experience for the children and the volunteers! Most churches send their mission-minded teens to Christian Youth In Action training where they learn to teach a Bible lesson, counsel a child for salvation, teach a missionary story and songs. CEF will provide a strategic plan, training, materials, background screenings and coaching for your team. Contact your local CEF office to find out what is happening in your area..